VR, AR, and MR are going to change the world! We will all be wearing headsets everywhere by 2025! Life as we know it will be changed forever! Businesses that don’t capitalize on this seismic shift in technology and culture will be doomed! This is The Fourth Transformation: How Augmented Reality & Artificial Intelligence Will Change Everything in a nutshell. I consider myself a casual VR, AR & MR enthusiast (which I will refer to simply as VR for brevity sake from now on). I log 6–12 hours in Oculus, Vive and Gear VR a month, subscribe to Inside’s VR & AR newsletter, and serendipitously encounter news articles on the subject through my daily intake of tech news. Now that you know my level of interest on the subject, I can tell you that this book was not intended for me. This book was written for those who have little to no knowledge on the subject of VR and want to learn what it’s all about. Unfortunately, I do not fit this description. Aside from some interesting anecdotes, I found nothing new and novel in this book. 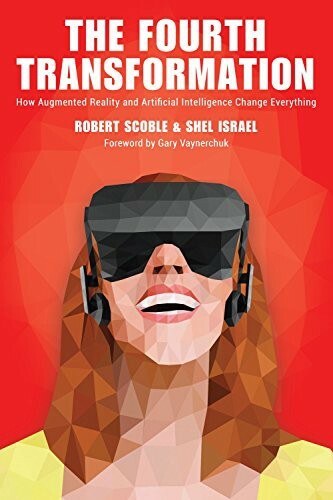 I first heard about the book after hearing one of the authors, Robert Scoble, on my favorite podcast, T.W.I.T., ranting and raving about the imminence of a VR tsunami of change coming to all our lives. Most tech enthusiasts understand that VR will change everything, but many know that we will not see big changes any time soon. However, Mr. Scoble was convinced that we are going to start seeing big changes this year. Most of his hype was fueled by the bold prediction that Apple will be entering the VR arena this year — which if true, would definitely solidify the industry at large as Apple usually waits to enter specific markets after the early adopter phase. I decided that his passion is stoked by either lunacy, misplaced excitement, or a strong understanding of a subject that he clearly spent a great deal of time researching. So I decided to give his book a whirl. I zipped through the first two chapters, understanding that they would of course have to introduce several concepts to frame a discussion about VR. Then as the chapters went on the authors glossed over some of the high profile VR stories and experiences, such as Facebook’s involvement in VR, The Void VR amusement parks, and drone racing — all things even a casual follower of VR would know a great deal about. After this staccato presentation of well-known VR players, the book jumps back to explaining basic concepts of mixed reality, spatial computing and eye tracking. Setting up material that would only be interesting to first time readers on the subject of VR. The most interesting portion of the book I found was towards the end. This is when they start riffing through specific examples of how VR is being used in business, education, and health. There were real-world examples in here that I have never heard before and allowed me to gather more context of what is happening in the world of VR. The book concludes with Black Mirror style musings of what could possibly go wrong as this technology is introduced to the masses. I found this quite interesting but each scenario was merely presented, rather than analyzed and discussed. So it came off more as a rapid-fire stream-of-consciousness from a conspiracy theorist rather than a well thought out and deep analysis of potentially world-changing and nefarious outcomes. Even though this book does not dive very deep on the subject of VR, I would not call it a bad or uninteresting book. I just believe it is a book targeted to VR newbies. If you are a stakeholder in a company that stands to gain or lose value due to the impending VR phenomenon, and you know nothing about VR — this book is for you. If you are already up to date with the latest VR news and technologies, then don’t expect to find much new information in The Fourth Transformation. I would say go ahead and read it if you want to microscopically grow your level of context surrounding business and cultural changes already happening with VR.